Chicken pox may not be a life threatening disease, but it is dreaded by most because of the highly contagious nature of the infection. Chicken pox generally develops in children causing the distinctive blisters, by which most of us recognize the condition. Chicken pox in infants and children is problematic mainly because of the symptoms associated with the condition. Chicken pox infection causes severe itching and skin irritation, but scratching at the blisters simply aggravates the problem and the breakage of blisters can be even more problematic. Chicken pox blisters, if burst or scratched at can cause severe and rather permanent chicken pox scars. The main concern for any individual would therefore be to minimize the itching and irritation and to resist the urge to scratch at the blisters. Treatment for chicken pox is directed primarily at providing relief from the symptoms, rather than actually curing the condition. This is because of the very nature of the disease and what causes chicken pox. Chicken pox is caused by a viral infection, and treating the chicken pox virus with antibiotics would be ineffective and in fact harmful. Antibiotics are simply meant for the treatment of bacterial conditions, but will be ineffective against viral infections. Chicken pox remedies are therefore extremely popular and constitute the first line of treatment for the condition in most parts of the world. Home remedies for chicken pox are also popular for the treatment of the condition because of the simple reason that most of these treatments and home cures are non invasive and also pose little to no health risks, because of the absence of any potent chemical compounds. Although chicken pox is generally thought of and regarded as a childhood ailment that most of us suffer from and leave behind, the condition can continue to plague some adults. Children who develop a chicken pox infection are unlikely to suffer from the disease again because of a natural immunity that is developed against the chicken pox virus. This said, it should be pointed out that even after the chicken pox infection has resolved, the virus is not eliminated from the body, but remains in a dormant state. In some cases the virus may resurface after years or even decades to cause not chicken pox but shingles. This is a lot more serious a condition than chicken pox. A chicken pox infection is also a lot more threatening when it develops in adults as compared to in kids. Adults who have never suffered from chicken pox should therefore be extremely cautious about exposure to the virus. Similarly when dealing with chicken pox and pregnancy there are some significant risks and medical care should be provided. Chicken pox usually begins with a low grade fever, a mild headache and a feeling of weakness. A rash appears on the skin on the first day of the disease. This is in the form of tiny red spots on the skin, mostly on the upper back or chest. In more severe cases, a rash may appear on the face and lower extremities. The papules turn into blisters and finally become pustules and form scabs, which fall off. They come in successive crops, so that while some are drying, others are beginning to form. The skin clears after a few days and the child feels well again. The duration of this disease ranges from ten to twenty-one days but is usually between fourteen and seventeen days. 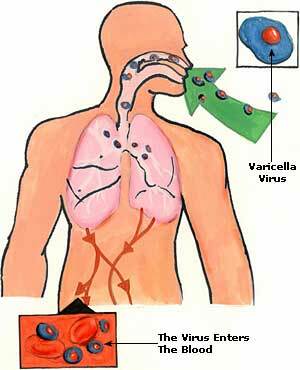 Chicken pox is caused by a virus. Many researchers believe that the disease is closely related to a much more serious condition known as shingles or herpes zoster that affects adults. The basic cause of the disease, as in most cases of childhood fevers, is however, persistent wrong feeding of children, which results in diminished defense mechanisms of the body. Diet and food intake does not have any direct bearing on the disease however, and the effects are mostly incidental or indirect. A diminished digestive capacity would for example necessitate a diet that consists of foods that are easier to digest, and foods that boost immunity would help to fight off the infection. While chicken pox causes may be obvious enough it is the risk factors for contagion and the stages of infection that you need to be aware of. Preventive measures are the only effective strategy against chicken pox infection and the best defense in our arsenal would be the chicken pox vaccine. Vaccination offers close to complete protection and the infection may only develop in some individuals, but in such cases the effects of infection are very mild. Chicken pox is highly contagious and could be easily passed on through direct contact with an infected individual or through contact with contaminated objects and areas, such as through contact with fluid from chicken pox blisters, or also by being in the vicinity of an infected person when they cough or sneeze. This may seem simple enough, but it isn’t as straightforward as it seems. 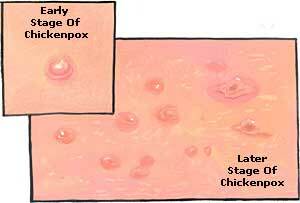 The problem with controlling the spread of the chicken pox infection stems from the chicken pox incubation period. The chicken pox incubation period in both babies and adults is characterized by an absence of symptoms. Whether dealing with chicken pox symptoms in adults, infants or kids, the symptoms and signs of infection only surface around ten days to even three weeks after the infection. While the incubation period may be quite lengthy, the period of contagion begins a day or two prior to the outbreak, making this the highest risk period for contagion as there are no warning signs of infection. This period of contagion lasts so long as there are any uncrusted chicken pox blisters present. In the case of babies or infants, there is not much risk of them developing an infection in their first year if their mothers have had chicken pox in the past or were vaccinated. In such cases the infection is usually very mild. This is because babies have a natural immunity that is passed on through antibodies from the mother’s blood. Mothers who have never suffered from chicken pox and have not been vaccinated do have some cause for worry however, as in such cases babies under a year of age could develop severe chicken pox. Chicken pox symptoms in children are also likely to be a lot more severe in children who suffer from some immune system disorder or if their immunity is weakened because of some other illness or as a result of medications. When dealing with chicken pox in infants treatment advice from your doctor should be followed meticulously. Chicken pox remedies are not just for adults and can help for children and babies alike. The remedies are primarily aimed at providing relief from the symptoms and to minimize itching and prevent scratching. The biggest problem for most individuals is the after effect of scratching at blisters, which leaves behind scars. Chicken pox scars removal can be a lengthy and tedious treatment procedure. Chicken pox and shingles symptoms and treatments do vary, but research indicates that individuals can greatly boost their immunity against infection through some simple diet practices. According to a study conducted, individuals who consumed significant quantities of fruits and vegetables daily had immunity against the virus three times higher as compared to those who ate less than one serving a day. The use of brown vinegar is one of the most important among the several home remedies found beneficial in the treatment of chicken pox. Half a cup of this vinegar should be added to a bath of warm water. This will relieve the irritation of the skin. A bath of oatmeal is considered a natural remedy for relieving the itch due to chicken pox. This bath is prepared by cooking two cups of oatmeal in two liters of water for fifteen minutes. This mixture is then put into a cloth bag, preferably cotton, and a string is tied tightly around the top. This bag is allowed to float in a tub of warm water, and swished around until the water becomes turbid. Precaution should be taken to ensure that the bag is not torn. The child with chicken pox can splash and play in the water, making sure that water goes over all the scalds, while the pouch of oatmeal can remain in the tub . Green pea water is another effective remedy for relieving irritation of the skin. The water in which fresh peas have been cooked can be used for this purpose. Baking soda is a popular remedy to control the itching in chicken pox. Some baking soda should be put in a glass of water. The child should be sponged with this water, so that the soda dries on the skin. This will keep the child away from scratching the eruptions. The use of vitamin E oil is valuable in chicken pox. This oil should be rubbed on the skin. It will have a healing effect. The marks left by chicken pox will fade away by this application. The use of honey as an external application has also proved valuable in chicken pox. The skin should be smeared with honey. It will help in the healing of the disease within three days. A mild sedative herbal tea can also prove beneficial in the treatment of chicken pox. This tea can be prepared from any of the herbs like chamomile (babunah), basil (holy basil), marigold (zergul) and lemon balm (billilotan). A little cinnamon (cinnamon), honey, and lemon may be added to this tea. 1t should be sipped slowly several times a day. To begin with, the patient should be put on a juice diet for a few days. He should be given plenty of raw fruit and vegetable juices. Lemon juice is considered to be especially beneficial. As the condition improves, the patient can be placed on an all-fruit diet for the next few days. Thereafter, he may be allowed to gradually adopt a well-balanced diet, with emphasis on fresh fruits and raw vegetables. A small warm-water enema should be administered daily during the initial juice fast to cleanse the bowels. The patient should be kept in a well-ventilated room. As light has a detrimental effect upon the eyes during an attack of chicken pox because of the weakened condition of the external eye tissues, the patient should shade his eyes from the direct light or the room should have subdued light. Application of mud packs on the abdomen twice a day, in the morning and evening, and repeated applications of chest packs will be beneficial. Lukewarm water baths can be given every day to relieve itching. For better results, margosa leaves can be added to this water. The nails of the child should be kept clipped to prevent him from scratching, otherwise, germs on the skin may be scratched into the blisters, causing more severe infection.